Etihad Guest has launched new 20% points to miles conversion bonus that is valid April 1 – 30, 2019. The bonus is valid only from select conversion partners listed below (probably makes sense to do the conversion early in April if possible). Marriott Bonvoy brought back the popular SPG Member Exclusive Offers in February and March (read more here and here) and appears to have launched new version for April based on an email that a reader forwarded to us. Members (not all) have been selected to receive one of the offers from bonus points, elite qualifying bonus nights to free nights certificates through June 30, 2019 or 90 days after registration. Marriott Bonvoy has launched new sale for stays in Australia, New Zealand, Fiji, New Caledonia and Samoa. Members can save up to 30% off their stays through August 31, 2019 if booked by April 30 using promotional/offer code W21. We (Rafflecopter widget) randomly chose the winner of the 100,000 Marriott Bonvoy points giveaway that ended on Friday night. The person whose name is displayed below will receive an email from us over the weekend with instructions how to redeem the prize. LAST CALL: 100,000 Marriott Bonvoy Points Giveaway! Enter By 11:59PM EDT On Friday March 29, 2019! To celebrate the launch of Marriott Bonvoy and their Double Take (read more here) and targeted promotions (read more here), we decided to launch on Monday a giveaway for 100,000 points that is about to end. The giveaway is soon ending and you must enter by 11:59PM EDT on Friday (March 29, 2019). We will announce the winner on Sunday (March 31). The Aeroplan program has launched 30% and 35% bonus (latter targeted) for conversions from hotel loyalty programs to miles between March 25 – April 22, 2019. Conversions from Radisson Rewards have special bonus of 65% (nothing on Radisson’s website about this yet)). Marriott Bonvoy has launched new sale for stays at Marriott, Sheraton and Westin Vacation Club properties through June 14, 2019. Members that book using promotional code M11 can save 20% off their stays. There are some exclusions (see the T&Cs). Marriott Bonvoy has launched new sale for stays in Thailand, Vietnam and Cambodia through July 31, 2019. Members can save up to 35% off their stays booked using promotional code ADP by March 24. Marriott Bonvoy has teased about the new Double Take-promotion for a month but offer begins today and is valid for stays between March 19 – June 4, 2019. Members can earn double points starting from the second stay and there is an additional weekend stay bonus of 500 points for affiliated US credit card holders. A LoyaltyLobby reader dropped us an email yesterday about a parting gift that she had received from her multiyear Ambassador after dropping to a Marriott Bonvoy Titanium Elite. Have other readers received gifts from their Ambassadors? These used to be fairly common on birthdays, milestones and such but haven’t heard any other recent report. 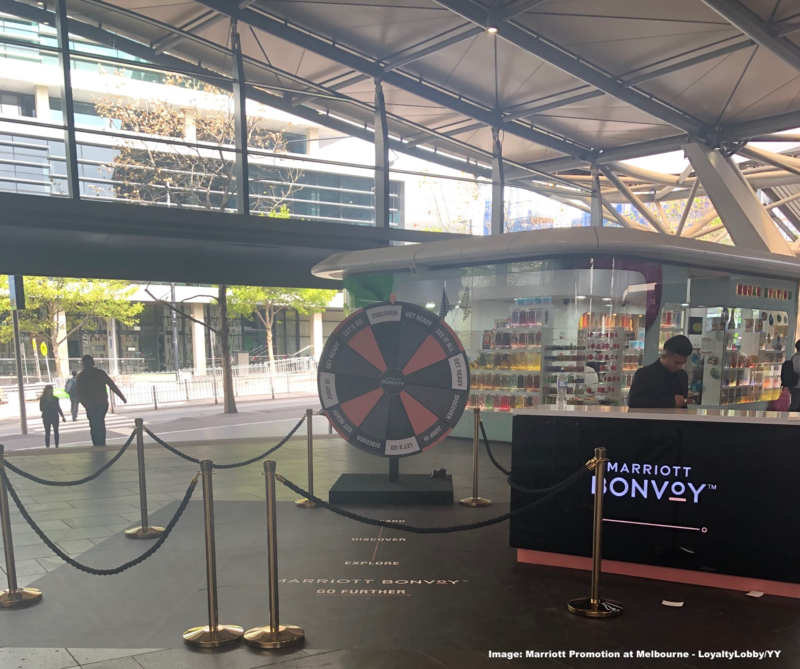 In order to drive membership sign-ups Marriott BONVOY is now engaging customers through a Wheel of Fortune raffle in public places such as at Melbourne’s Southern Cross Station this week. After the disastrous Starwood merger Marriott now not only has a huge amount of brands on their hands they need to market but also a brand new loyalty program in name with pretty much zero recognition. A LoyaltyLobby reader sent us a text that a former Marriott customer service employee had apparently posted on the internet (we have not been able to independently verify this). Marriott Bonvoy customer service has struggled ever since the program merger in August last year and reading the text below one can understand why.